Be the first to share your favorite memory, photo or story of Homer. This memorial page is dedicated for family, friends and future generations to celebrate the life of their loved one. 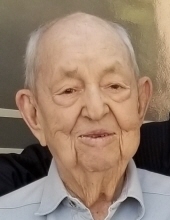 Homer L. Holman, 96, of Great Falls, passed away at his home on March 26, 2019 surrounded by his family. Homer was born in Great Falls on May 18, 1922 to Leonard and Gertrude Holman. His early childhood years were spent at Volta (Ryan) dam where his father worked for Montana Power. Homer graduated from Great Falls High in 1940. Shortly after high school Homer learned to fly and in 1942 he joined the Marine Corp as a Naval Aviator during WWII. While in the Marines he held the rank of 1st Lieutenant and was a flight instructor and a safety officer teaching airmen to land on aircraft carriers. Upon his return to Great Falls, Homer was employed as a flight instructor until he started his own flight school in Fort Benton. Homer returned to the Great Falls airport and in 1950 started Holman Aviation. After his tour with the Marines he also joined the Reserves in Spokane, WA where he met Dorothy Turner. Homer and Dorothy were married on December 2, 1956. Together they raised 5 children. In 1972 Homer expanded his business to include Kalispell, MT and later sold the Kalispell location to his son Robbie Holman. In 1990 his youngest son, Dwight, joined the business and continues to operate the business today. In 2008, his granddaughter, Jamie Ronholdt joined the business. Homer was very proud to have 3 generations involved in the business. Homer continued with the business until his passing. Homer and Dorothy also owned and operated the Travel Center travel agency. During this time they enjoyed many trips to Europe and Asia. Homer and Dorothy also enjoyed traveling in their motorhome. They took many trips across the country and spent winters in Fort Meyers, Florida and Surprise, Arizona. Homer was a charter member of the Lindbergh Lake Logging Company with his best friend, Ward Junkermier. If you needed to find Homer on the weekends, you looked no further than the Junkermier cabin on Lindbergh Lake. Homer was a member of many organizations including the Aircraft Owners and Pilots Association of which he was a member of for over 74 years and more recently the Daedalians. Homer is survived by his wife, Dorothy; his daughters Sherrie (Ted) Higgins of Sun City West, Arizona, Beryl Nyce of Garberville, California; sons Robbie (Mary) Holman of Whitefish, Montana, Randy (Lorraine) Holman of Great Falls and Dwight (Debbie) Holman of Great Falls, his brother Glen (Marion) Holman of California. Homer has numerous grandchildren, great grandchildren and a great great grandchild. Homer was preceded in death by his parents, his brother Gordon Holman and his granddaughter Sara Holman. Homer will be remembered for his generosity, love of family and friends and his can do attitude. A celebration of his life will be held on Saturday May 11, 2019 at the Meadow Lark Country Club from 2-5 p.m. Homer always loved a good party. To plant a tree in memory of Homer L. Holman, please visit our Tribute Store. "Email Address" would like to share the life celebration of Homer L. Holman. Click on the "link" to go to share a favorite memory or leave a condolence message for the family.